If you have any questions please feel free to shoot us an e-mail at circleplayersnj@gmail.com. Shakespeare’s classic tale of a brave and loyal general, who receives a prophecy that he will become king. 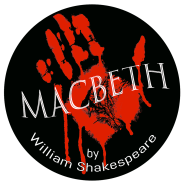 Consumed by ambition, Macbeth murders the King and takes the throne, but is wracked with guilt and paranoia that spurs his downfall. The production runs November 16 through December 2, 2018. Macbeth A career military man. Has worked his way up from enlistment to mid-level officer. Comes from a very poor background, but full of courage and ambition. Volunteers for multiple tours of duty. A trained killer with years of PTSD simmering below the surface. Lady Macbeth Macbeth’s wife. Strong-willed, but fiercely protective of her husband. The couple desperately wants a child, but have not had any luck. They are each other’s everything. Macduff Same age and career point as Macbeth - also in the military. They are friendly, but fiercely competitive with one another. Macduff is strong, courageous, but his soft spot is for his wife and children. The military is just a job to him. His family is everything. Duncan (also plays the Porter, Doctor and Siward). A high- level officer in the military, overseeing Macbeth, Banquo and Macduff. He comes from money and entitlement, and has never had to kill anyone. He orders other people to do that. Warm heart. Banquo (also plays Seyton). Macbeth’s friend, about ten years younger. A better man than Macbeth, but doesn’t know it. Looks at Macbeth as a mentor. A born leader and loving single father. Lady Macduff (also plays Donalbain, Nurse and others) A loving wife and mother - she once had a career, but life surprised her when she met Macduff and immediately fell in love. Her family is her passion, but she is a strong fighter. The scene with her and the murderers will be quite graphic and violent. Malcolm Duncan’s eldest son. Fiercely smart, admires men like Macbeth and Macduff for their courage but struggles to find that within himself. Very close with his father. Fleance (also plays Macduff’s son and Siward’s son) Age 8-13. Fiercely protective of his parents in all three roles, and stands up to attackers despite his youth. *The witches, whether playing themselves or other characters that move the plot forward, are always onstage, participating in or watching events. They are three homeless-by-choice people (could be male or female actors) with a mutual love of the occult and distaste for the petty problems of the world. They don’t dictate Macbeth’s path; they only encourage what they already see in him. Looking for one of the witches to be able to play bongo-style drums. Should be able to improvise based on director’s guidance in rehearsals and then set choices for performance.